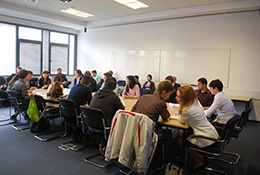 The American University in Bulgaria relies on University committees for advice to key administrators on matters of policy. Reviews allegations of academic dishonesty, plagiarism, or other forms of academic misconduct, and makes recommendations to the President for suspension, dismissal, or other appropriate action for persons found responsible for sufficiently serious violations. Reviews the academic progress of students, determining whether students are maintaining good academic standing, and whether those whose performance falls below the levels articulated in University policies are subject to academic warning, probation, suspension or dismissal. The Committee will monitor the progress of those students on probation to determine whether the conditions of probation have been satisfied. The Dean of Faculty as Chair holds the third staff seat. Evaluates and interprets US, Bulgarian or any other appropriate accreditation criteria, assists in the process of gathering information and opinions from all university constituencies, assists departments in the process of writing and editing their program accreditation reports, oversees the writing and editing of the US accreditation self-study reports, and participates actively in the onsite visits of accreditation teams. Advises the Provost. The chairs of sub-committees is responsible for writing the narrative on each NEASC accreditation standard participate in the work of the Accreditation Committee during US accreditation cycles. To review applications for the fall and spring semesters. In determining admission, consideration is given to many different indications of a student’s qualities and abilities: scholastic achievements, performance on standardized tests, extracurricular activities, personal experience and leadership potential. The Admissions Committee evaluates applicants on the strength of the application as a whole and makes initial recommendations for financial aid and merit-based awards. Committee deliberations are confidential. Meets weekly especially in the second semester. The Admissions Director as Chair holds the third staff seat. Forecasts revenues and costs for the University and advises on the creation of the annual budget. The Committee advises the Vice President for Finance and Administration. The Chair holds the fifth staff position. Solicits nominations for honorary degrees and distinguished service awards from the University community, reviews nominations, and makes recommendations to the President for candidates for conferral of the AUBG Honorary Degrees and Distinguished Service Awards. Guarantees the observance of ethical standards and legal responsibilities in conducting off- or on-campus surveys by faculty, staff, and students. Membership: Faculty: 3; Staff: 2. Conducts the selection process and chooses the recipients of named scholarships, funded by private individuals, corporations and foundations. Awards are given when available and are directed towards students’ tuition. Hears complaints and makes recommendations to the HR Director. Members of this committee must undergo mandatory training on the subject matters addressed by the committee. Reviews non-academic grievances against students, student clubs or other student entities, cases of student violence and other matters in which students are alleged to have broken housing policies, student conduct policies, technology policies, general ethic codes or other internal University regulations. The Committee makes recommendations to the President. Requests, gathers, reviews and evaluates data on the outcomes from the overall academic, co- and extracurricular experience of the AUBG students. As a result of research findings, makes recommendations for improvement in the academic and residential life programs to the Provost. The Provost as Chair holds the third seat. Advises the Dean of Students regarding non-curricular student activities and issues. Administers the annual Student Travel Fund. Selects participants in study abroad programs. Recommends the Student Commencement Speaker to the President. Recommends the Presidential Medalist to the President. The Dean of Students as Chair holds the third seat. Facilitates the development of staff and managers through recommendations for training programs, individual development plans, and improvements in the annual evaluation process consistent with the goals for development of the institution. The committee prepares guidelines and reviews applications for professional development support and makes recommendations to the Provost.